www.bobbynash.com: New Ad. What do you think? I created a new ad to help promote some of my novels. What do you think? 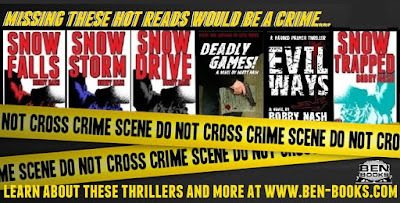 It would be a crime to miss these thrillers from author Bobby Nash and BEN Books! 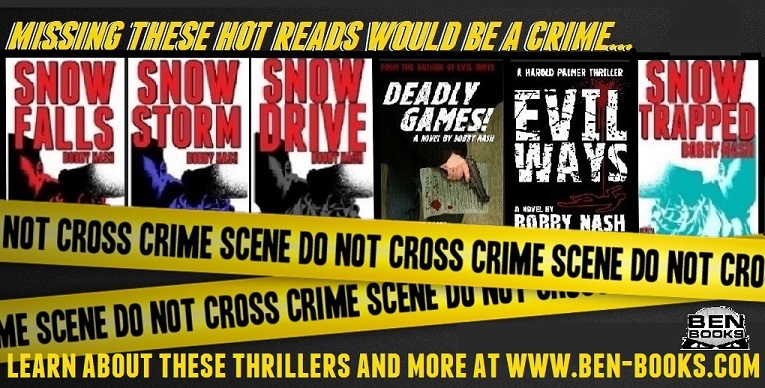 EVIL WAYS, SNOW FALLS, SNOW STORM, SNOW DRIVE, DEADLY GAMES!, SNOW TRAPPED, SNOW Series 1, Vol. 1, and more are now available at www.ben-books.com and wherever you buy your favorite novels. Available in paperback and ebook. Read them all FREE with your Kindle Unlimited subscription. SNOW Series 1 Vol. 1 and EVIL WAYS also available in hardcover. DEADLY GAMES! hardcover coming soon!